In many industrial facilities, compressed air often is referred to as the fourth utility, after electricity, natural gas, and water. Faced with continually rising energy costs that were compromising profitability, a client contracted with n2 Integrated Energy Solutions, LLC to find a better way to manage the cost of delivering compressed air throughout their plant. Their electric compressor drive was a significant contributor to their electricity demand and operated at 90% of full load electrical power even when running at typical partial load of 60%, which resulted in a significant amount of wasted energy and expense. We immediately determined that based on their compressed air usage, a natural gas engine driven compressor combined with a waste heat recovery system would provide an energy efficient solution. 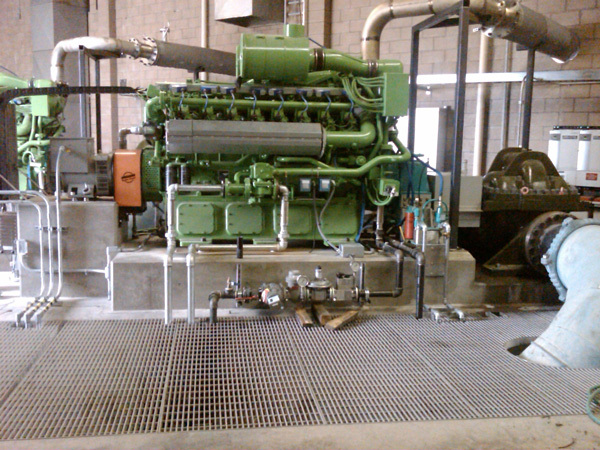 We installed a natural gas engine equipped with a rotary screw drive compressor and load controls that would reduce fuel consumption by as much as 38% when the engine was running at reduced RPMs. In addition, 30% of the inlet gas BTU rating was recovered for the production of both hot and chilled water, further contributing to an improved energy footprint. The payback period on this system was in the range of 1.8 to 3.25 years. 200 HP Electric Motor costs $58 per Hour to operate On-Peak. Gas Engine cost is $7 per Hour at all times. 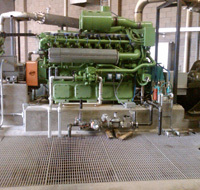 Along with reduced power demand and energy consumption, this natural gas engine-driven solution offered high efficiency, even at partial loads, and offset the cost of providing steam and chilled water for heating and cooling. Very importantly, it ensured continual availability of compressed air during power disruptions to keep plant operations running smoothly and continuously. If you are interested in learning more about this project, or how we can help you control compressed air costs in your facility, contact us directly.